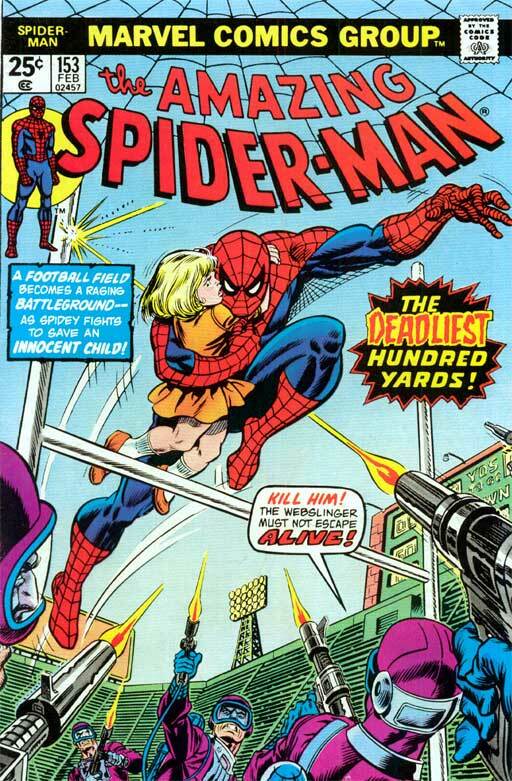 The first Spider-Man comic I ever read was AMAZING SPIDER-MAN #153. It wouldn't be until over twenty years later that I would find out that it was a classic issue done by two all-time greats. Having said that, I must have read this particular issue dozens of times as a kid. It was my brother's, and it was a crappy reprint by the local bookstore, and is now tattered, but still completely readable. The story revolves not around Peter Parker, your friendly neighborhood Spider-Man, but on Dr. Bradley Bolton, a computer wizard who used to be a big man on campus at Empire State University. 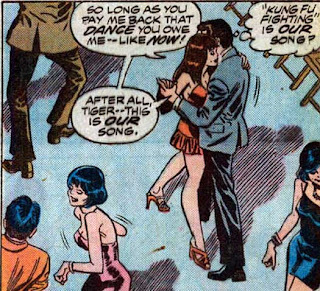 His daughter had been kidnapped, but despite meeting up with Peter Parker and Daily Bugle reporter Ned Leeds, he doesn't mention this fact. Instead, he chooses to recount his final football game for the school; the one where he was almost a hero. He then goes on to mention that he was only inches close from making that final touchdown, when he gets called away by a messenger, and we see Bolton talking to a man named Paine, who tells him about the conditions for his daughter's return. This scene is important, not only because it emphasizes that our heroes have no idea what's going on, but because it handles the continuity of a shared universe in such a way that I preferred at the time. A comic these days would not devote this much space to telling you what S.O.S. 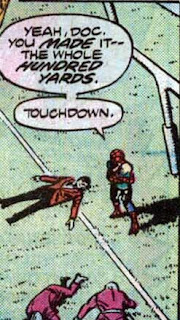 means in Morse code, and it's a real shame, because it's because of little things like this that vindicated comics to me in the first place back in the days of people telling you that comics are silly stuff from which you'll never learn anything. Hell, I could say I knew what Morse code was, and how to spell S.O.S. in it because of comics. (Vocabulary was the other selling point.) These days, a writer would take little things like this for granted and either leave the reader confused as to what was going on, or worse, turn the reader off on account of inaccessibility. There's also the advantage here of on-the-spot characterization, from which you can tell the basic personality and characteristics of a certain character as well as that person's dynamics and relationship with another from the barest of clues. I can see how this can be seen as a problem as it relates to character development, since no one really can be summed up so quickly, but that wasn't what was happening at all. What we basically got was just a quick summary of where they were now, and what they meant to the people around them. For example, here's Mary Jane Watson, a girl who you really don't need to know anything more about than "She's mad at Peter--"
Anyway, as brilliantly as it's all been done up to this point, the real flash of genius is the climax. Bolton leaves the party, and Peter follows. However, since Peter knows nothing about what's going on, other than having a hunch that something is wrong, he goes the completely wrong way. Bolton is then forced to face off against his daughter's kidnappers alone on the football field, and when the kidnappers won't give her back, he runs the hundred yards. See the genius of it? 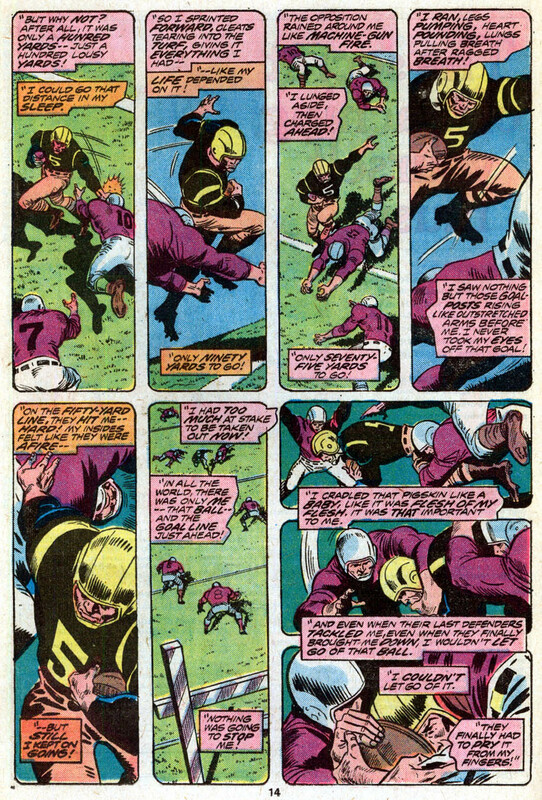 It's composed in exactly the same way as the football flashback sequence from earlier in the issue. And when Spider-Man finally shows up (too late), Bolton lives long enough to be assured that not only was he able to save his daughter, but that he crossed the touchdown mark. This is the first time I can remember where I learned that repetition can significantly add poignancy and resonance to any given story or theme. 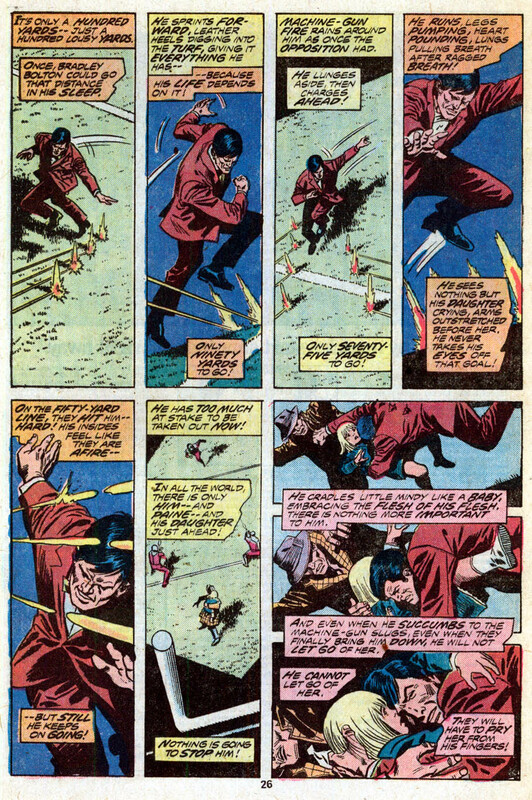 By repeating the composition and layout and the script (with slight changes where necessary or where the drama called for it), Wein and Andru instantly called to mind the previous scene, without having to resort to cheap "He ran this race a long time ago, and failed..." descriptions. This technique amps up the drama and makes you truly feel for Bolton. It's been used in some of my all-time favorite works, such as WATCHMEN and GOOD-BYE CHUNKY RICE. 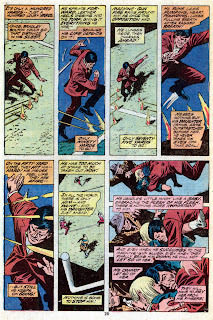 Decades later, it's a technique that's stuck with me, and it's one of the things that always keeps my eyes wide open for intriguing panel layouts and breakdowns. 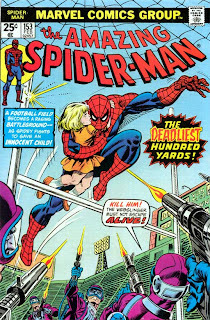 Whether or not I have AMAZING SPIDER-MAN #153 to thank - whether it's responsible for my love of technique and symmetry and reflection, or whether anything else would have triggered it anyway - I'll likely never know. 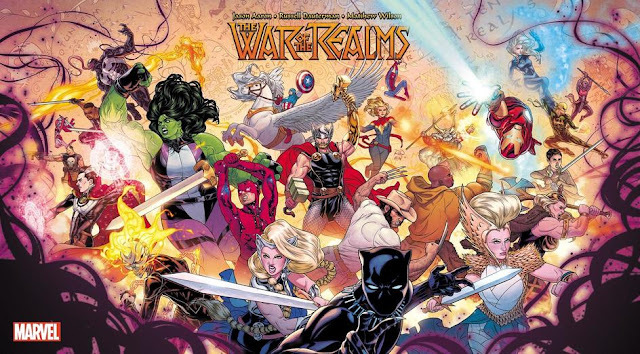 One thing I do know, though, is that I do have it to thank for sparking a love for comics. And for that, to Mr. Wein and the late Mr. Andru, I'd like to say thanks. You guys scored a touchdown with this one. 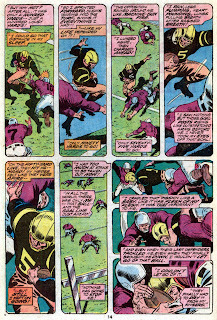 EDIT: This issue was inked by the great Mike Esposito, who died today. For more Great Back Issues, click here. For more Comics Cube! Reviews, click here! 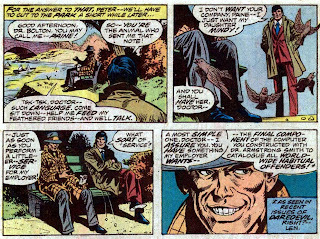 You can find this story in ESSENTIAL SPIDER-MAN Vol. 7! It is in one of the Essential volumes; that's where I read it. And it is a great, great issue. 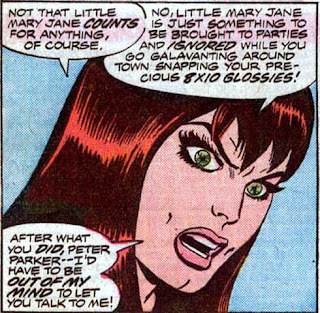 I particularly love Spidey's "The Hell it isn't!" Thanks E.! It's one of my favorite stories ever. Spidey at the end was very very relatable - other heroes would have actually said he wasn't worth it and left him alone. Duy, it's in Essential Spider-Man Vol 7 and it's one of my fave Spidey tales too. I think it was the story he drew directly before tackling the Superman/Spider-Man team-up. Essential 7! Thank you, sir!